The last installment in our Seasonal Shawl Series, this winter shawl is best made from a chunky, insulating fiber so you can wear it in cold weather. 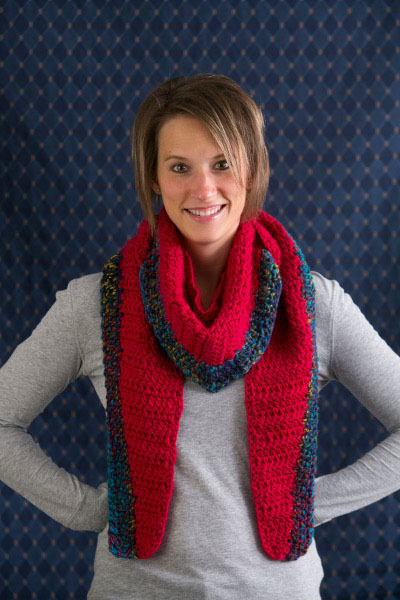 The shawl doubles as a cuddly scarf when wrapped around the neck. 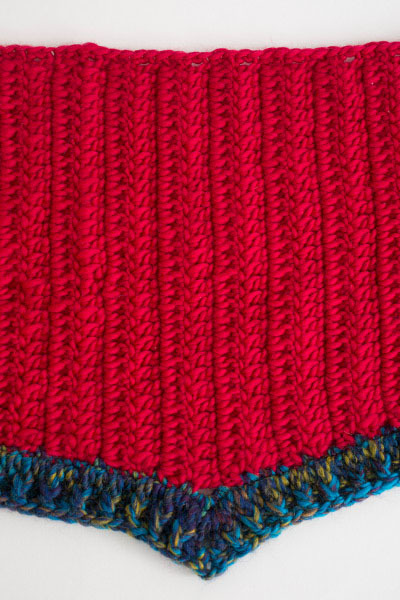 Shawl is worked side to side in increasing rows to midpoint, and then decreasing rows to opposite edge. Ch 2 at beginning of row does not count as a st. Adjust the size by changing the length to the midpoint. 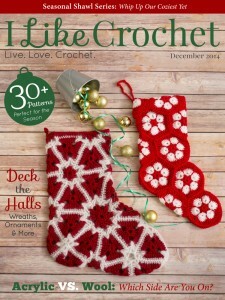 Edging is crocheted in rows. Move up markers for each row of edging. Rows 5-54: Repeat Rows 3 & 4 24 times, or until shawl measures approximately 38” (96.5 cm). Row 55: Turn, ch 2, pm around turning ch to mark center row, dc in same st and in each st across. Repeat Rows 56 & 57 until 3 sts remain. Final Row: Turn, ch 2, dc3tog, do not fasten off, pm in dc3tog to mark edge. Row 1 (RS): Turn, ch 1, 2 sc in side of ea row along straight edge to marked st, changing to CC with sl st to marked st, remove marker. Row 1: With CC, ch 1, *2 sc in side of ea row to market row,** (2 sc, ch 2, 2 sc) in side of marked row, rep from * to ** ending with final 2 sc in side of marked st, remove marker. Row 2: Turn, ch 3 (counts as dc, here and throughout), dc in next st and in ea st across to ch-2 sp, (dc, ch 2, dc) in ch-2 sp, dc in ea st across. Row 3: Turn, ch 3, *FPdc around next st, hdcBL in next st,** rep from * across to ch-2 sp, (hdc, ch 2, hdc) in ch-2 sp, rep from * to ** across, to last 3 sts, FPdc around next st, dc2tog. Fasten off. Watch your tension with your yarn hand. If you are pulling, even a little you’ll curl. Plus blocking after you’ve finished will straighten any minor tweeks.